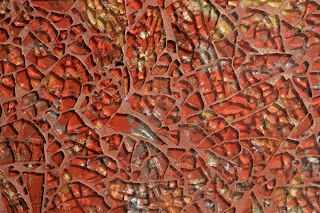 Rich, red Pompeii from her latest collection, Elements- reinterpreting Earth, Water, Wind and here, Fire. It speaks to me an a primordial level. The Spotlight collection, contains four sub-categories. 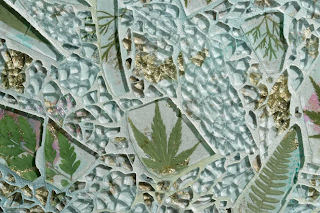 Organic incorporates real leaves into the mosaic, here the cool, inspiring Silver Leaf - perfect for a spa bath. Also from the Spotlight collection the sparkling Pop category in Mango colorway. I'd be happy every time I looked at this. 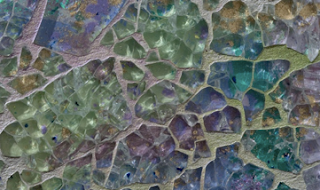 Finally appropriately named greens, blues and purples - Vineyard from the Core collection. It would fit right into The Cool House. Intricate, dramatic, sustainable, unique - there is something for everyone in Blakeley's collections. 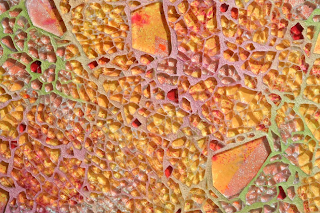 You can order Ellen Blakely mosaic glass through Artistic Tile or via her showroom or you can just admire the images on her website and dream.